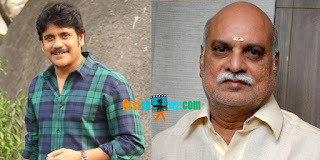 We have earlier informed to our viewers that Nagarjuna will be acting in yet another devotional film of K.Raghavendra Rao, and this time he will be seen as Baba Haathi Ram Ji, devotee of Lord Venkateswara. Om Namo Venkatesaya is the title under consideration to this film. The music siftings for the film have begun, and MM Keeravani will be composing the musical scores. Raghavendra Rao, Keeravani, Singers like Ramya Behara are participating in the music sittings. Mahesh Reddy who produced Shirdi Sai will be producing Baba Haathi Ram Ji movie, and the cameras will begin rolling from the month of May. After memorable hits like Anamayya, Sri Ramadasu, Shirdi Sai we have to see what Nagarjuna, KRR, and Keeravani have in store for us.